I’m sitting here watching the FIFA World Cup Quarter-final between Paraguay and Spain. I’ve just realised that I’m a South African in South Africa. I’m also a guest blogger on a global blog. Surely I’m entitled to a token World Cup post? I guess I should try and put a complexity spin on this post about soccer, but I can’t. I’ve come up with a blank. No matter which way I look at the sport, I cannot discern any complexity to the game (um, that’s a joke!). I can however look at the sport as an over-constrained system run by overly-bureaucratic administrators who fear pragmatism. Last night’s quarter-final between Ghana (or “the whole of Africa” as some referred to the team) and Uruguay was a prime example. This photo epitomizes the objections I have to the way rules are enforced in the game. The picture is of the handball that Suarez was sent off for towards the end of extra time last night. Had he not interfered Ghana would have won the game and been the first African side in the semi-finals. So a penalty kick was awarded (which Gyan subsequently missed). In a rugby match a penalty try would have been awarded for such a blatant infringement of the rules. Another example of the overly-constrained system that is soccer is the reluctance (read: flat refusal) FIFA have shown in considering the decision to implement more technology at games to assist the referees in making more accurate decisions. 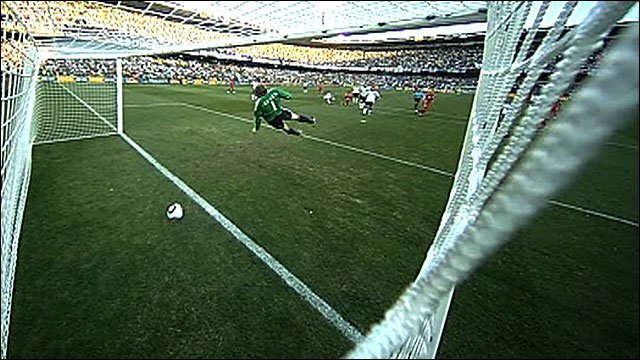 Had this technology been in place Frank Lampard’s non-goal would have been awarded – it crossed the goal line, but the referees claimed they did not see it. The state of global soccer, with FIFA at the helm, could be placed within the Simple Domain of the Cynefin framework. It’s a relatively simple game, with a simple set of rules. However, the way in which the system is being managed is no doubt forcing the game towards the boundary between the Simple and Chaotic domains. We know that systems that are overly constrained often descend into chaos. The key question for FIFA is this: to carry on in their paranoid beurocratic ways, that will most likely push the game/system in chaos, or to allow some measure of flexibility in that will help the system restore some sense of equilibrium. Up to you FIFA. Don’t say you weren’t warned.